Orvas Dren, a Dunmer warrior, is the younger brother of Vedam Dren, the Duke of Ebonheart. Orvas lives in Dren's villa on his own plantation, north of Vivec and east of Pelagiad. Although without formal position in House Hlaalu, he is highly influential behind the scenes. Orvas is a wealthy criminal and the Kingpin of the Camonna Tong, dealing in skooma and moon sugar. He owns a large contingent of slaves on his plantation and plays an important part in the Main Quest and the final House Hlaalu quest. Orvas must be dealt with to obtain the rank of Grandmaster in House Hlaalu, as it is highly doubtful that he will support an outlander for the position; he also has two of the councilors, Velanda Omani and Nevena Ules, in his pocket. Dren has allied himself and the Camonna Tong with the Sixth House and Dagoth Ur, as he states during the main quest if you opt to explain that you are trying to save Vvardenfell from Dagoth. As he sees it, the days of the Empire are numbered and its influence on Morrowind is waning. Somewhat ruthless, Orvas would not shy away from murdering his own brother, the Duke, as seen in his note. 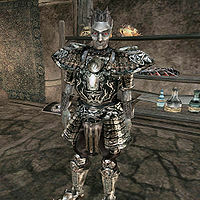 He is rumored to be nursing resentment of the Occupation and waiting for the right moment to create an insurrection against the Imperials should a crisis occur - like the one centered around the Septim succession. He is also rumored to be conducting a crackdown on the escaped slaves, even hiring bounty hunters to track down any who would help them. He is wearing a near full set of Orcish armor including the cuirass, both pauldrons, both bracers, greaves, and boots. He is wielding an ebony spear and he is carrying his key and around 500 drakes. Aside from his natural resistance to fire and the sanctuary provided by his ancestors, he knows no spells. Orvas is also depicted in Legends. If you attack Orvas or he notices you stealing, he will attack you and Ranes Ienith will teleport nearby to assist him. A successful intimidation will have him respond: "No %PCRace can intimidate me!". This will force you to end dialogue and give Orvas a fight value of 100, practically guaranteeing he will turn hostile. This page was last modified on 15 November 2018, at 17:54.